By the late 15th century there was a story circulating that Joseph had brought two silver flasks containing Christ’s blood and sweat to Britain, and that these two relics were buried in his grave. This tale has shades of the legendary Holy Grail, though there is no record of any shrine marking the spot of the grave, which there surely would have been if the incident had any basis in fact. Another variation on this theme mentions that Joseph buried the Holy Grail underneath Glastonbury Tor at the entrance to the Underworld, after which a spring, now known as Chalice Well, began flowing and its water brought eternal youth to whoever drank it. Perhaps the most famous legend concerning Joseph of Arimathea and Glastonbury tells of him bringing the Holy Thorn to the town. According to one version of the story, Joseph is said to have sailed over the flooded Somerset Levels to Glastonbury, where he planted his wooden staff in the ground. The staff then miraculously flowered into the Glastonbury Thorn – (Crataegus monogyna ‘Biflora’) – a variety of the common hawthorn which flowers twice annually, once in spring and again around Christmas time. The Glastonbury Thorn apparently attracted pilgrims during the Middle Ages, but was unfortunately chopped down during the English Civil War (1642-1651) by the Puritans (supporters of Parliament as opposed to the King) who disapproved of superstitious relics. In one tale the roundhead (puritan) soldier who destroyed the tree was blinded by a flying splinter. 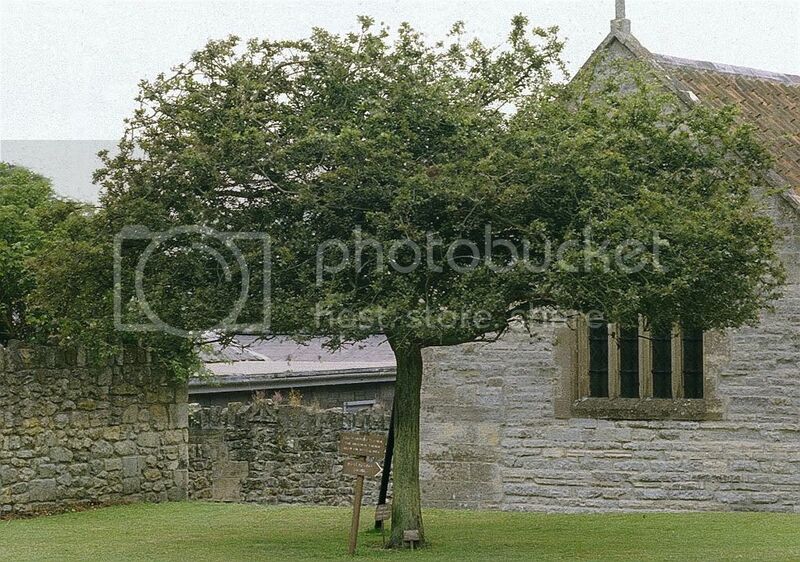 Fortunately, cuttings of the original Holy Thorn were taken and planted elsewhere in Glastonbury, and some survive today in the grounds of Glastonbury Abbey, St Johns Church and at Chalice Well. Every year at Christmas a sprig of the Glastonbury Thorn is cut by the local Church of England priest and the eldest pupil from St Johns school and sent to the Queen. This custom apparently dates back to the time of King James I of England (1566-1625), when James Montague, Bishop of Bath and Wells, sent a branch to Anne of Denmark, queen consort of James I.
. . . I was told by the innkeeper where I set up my horses, who rents a considerable part of the enclosure of the late dissolved abbey, that St. Joseph of Arimathea landed not far from the town, at a place where there was an oak planted in memory of his landing, called the Oak of Avalon; that he (Joseph) and his companions marched thence to a hill near a mile on the south side of the town, and there being weary, rested themselves; which gave the hill the name of Weary-all-Hill; . . . whether it sprang from St. Joseph of Arimathea’s dry staff, stuck by him in the ground when he rested there, I cannot find, but beyond all dispute it sprang up miraculously! ‘This tree, growing on the south ridge of Weary-all-Hill (locally abbreviated into Werrall), had a double trunk in the time of Queen Elizabeth . . .
One theory still entertained today is that Joseph of Arimathea may have been a tin merchant who brought the young Jesus with him on a trading voyage to south west Britain. However, this story is a relatively recent invention and originates with English hagiographer, antiquarian and author the Reverend Sabine Baring-Gould, who introduced the idea in 1899 in his Book of Cornwall. In a 1922 pamphlet the Revd Lionel Smithett Lewis, Vicar of St. John’s at Glastonbury for over twenty years, and deeply interested in stories of Joseph of Arimathea’s connection with Glastonbury, appropriated Baring-Gould’s idea, but moved the legend from Cornwall to Somerset. By the time it reached its final edition in 1955, Smithett Lewis’s’ St. Joseph of Arimathea or the Apostolic Church of Britain ran to about 200 pages, including 13 appendices, and included a claim that Glastonbury was the burial place of the Virgin Mary. Ashe, Geoffrey. King Arthur’s Avalon. London, Collins, 1958. Carley, James P. Glastonbury Abbey: The Holy House at the Head of the Moors Adventurous. Gothic Image Publications, Glastonbury, Somerset, 1992. Rahtz, Philip. Glastonbury: Myth & Archaeology. Tempus Publishing, Stroud, Gloucestershire, 2003. Mann, Nicholas R. The Isle of Avalon Sacred Mysteries of Arthur and Glastonbury Tor. St. Paul, MN, 1996. Smith, A.W. & Blake, William. ‘And Did Those Feet…?’: The ‘Legend’ of Christ’s Visit to Britain’, Folklore, Vol. 100, No. 1. (1989), pp. 63-83. Westwood, Jennifer. Albion: A Guide to Legendary Britain. London, Book Club Associates, 1986.
http://www.britannia.com/history/arthur/abbey.html – ‘Glastonbury Abbey and the Legends of King Arthur and Joseph of Arimathea’. http://www.somerset.gov.uk/media/1B25C/EUS_GlastonburyText.pdf – ‘An Archaeological Assessment of Glastonbury’ by Clare Gathercole.